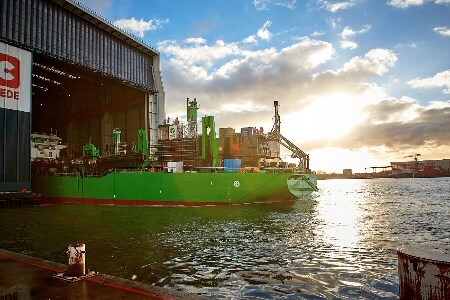 The launch ceremony of DEME’s 7950 m3 dual fuel trailing suction hopper dredger (TSHD) – Scheldt River – took place on 14 January at Royal IHC's shipyard in Krimpen aan den IJssel, The Netherlands. As a result of IHC’s continuous research effort on fuel saving and analysis of operational profiles, it has developed a two-speed propulsion drive. In contrast to conventional single speed propulsion, the IHC-patented two-speed gearbox ensures fuel savings when sailing at lower speeds. Scheldt River and Minerva are the first TSHDs to benefit from this innovation. Another innovation is the newly developed wing-shaped bow thruster tunnel. This new shape is the result of extensive hydrodynamic analyses and improves the bow thruster performance.